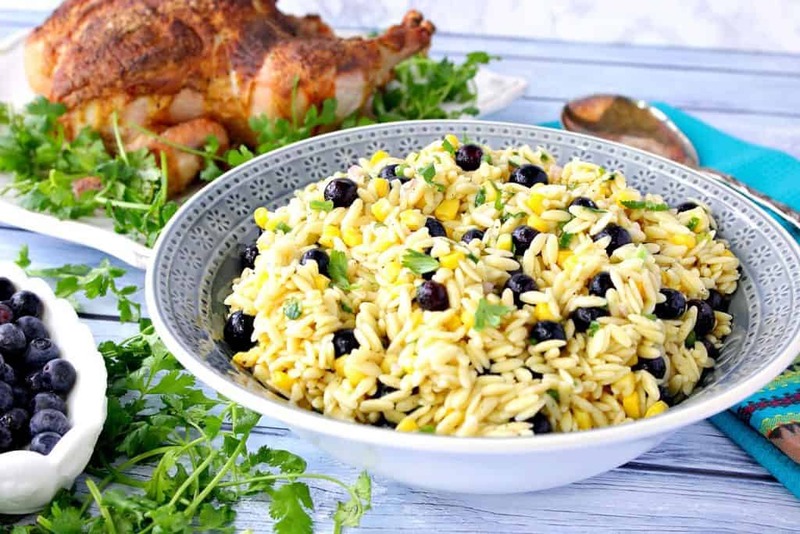 Surprise Chilled Orzo Pasta Salad with Sweet Corn & Blueberries may be a little unexpected, but after your first bite, you’ll keep coming back for more! 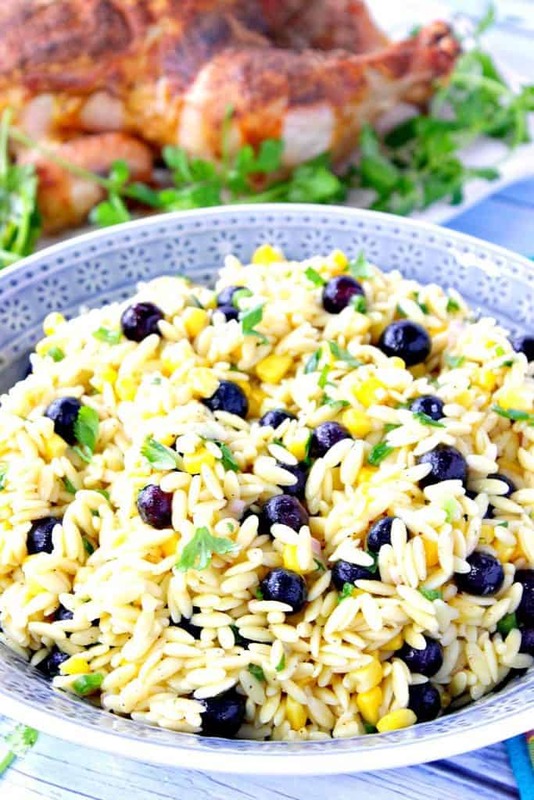 Surprise Orzo Pasta Salad with Sweet Corn and Blueberries takes about 15 minutes to assemble. This salad is best served chilled after it’s had had a chance to remain in the fridge overnight. This way all the ingredient flavors in the dressing can marry and unite into one rock-solid and tasteful union. I played around with the ingredients for this salad for quite some time until I was completely satisfied with how it all came together. 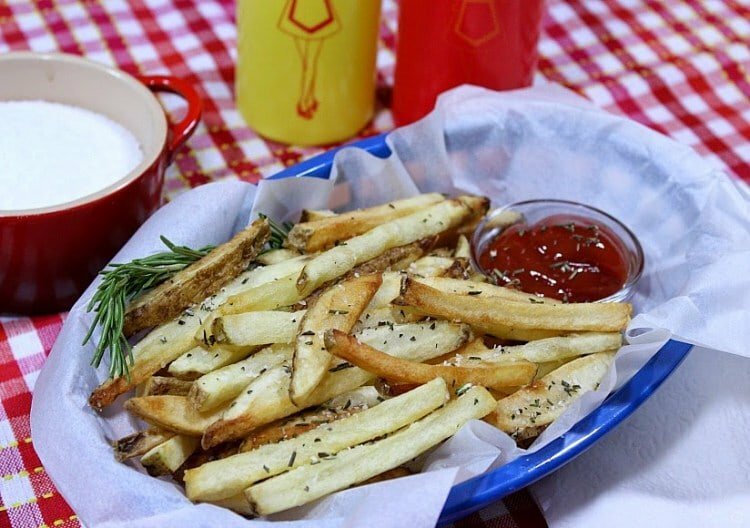 The addition of the honey to the dressing helps to round out the flavor of the dressing, and it plays well against the tart and tangy bite of the lime juice and Dijon mustard. The shallots are a nice touch without being overpowering, as onion or garlic sometimes are, and the final addition of fresh cilantro at the end is just light enough to lend a slight citrus flavor to an already unforgettable salad. 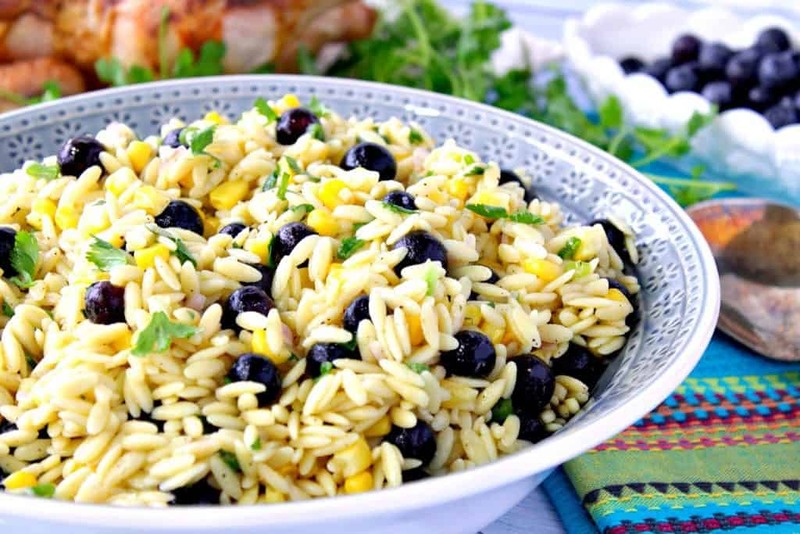 Assemble the ingredients for making Chilled Orzo Pasta Salad with Sweet Corn & Blueberries. Mince the shallots.Cook and drain the orzo pasta according to the package directions. Add the cooked pasta to a large serving bowl. In a small bowl mix together the dressing ingredients; shallots, lime juice, Dijon mustard, olive oil, honey, and black pepper. Pour the dressing over the pasta and mix well. Add the corn, chopped cilantro, chopped scallions, blueberries, salt, and additional black pepper (if needed) to the pasta and stir well to combine. Cover, and chill the salad at least 4 hours, but overnight is better. Stir before serving and garnish with additional cilantro if desired. Best served chilled, but this salad is also delicious at room temperature. This is one of the best cold pasta salad I’ve ever had, and the best part (other than the flavor, or course) is that there is no mayonnaise involved. 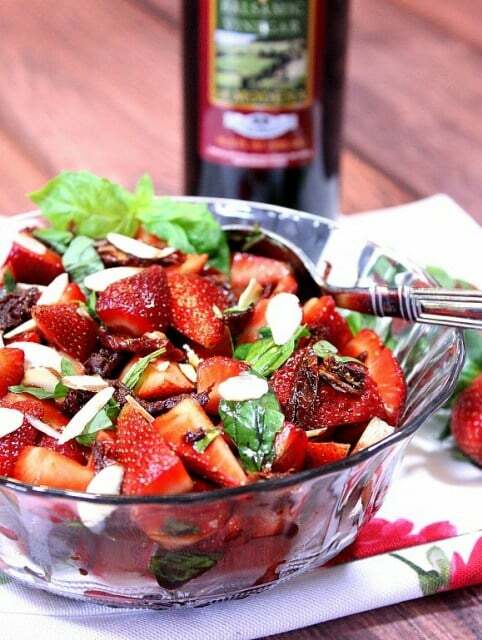 So even on the hottest of days, this salad can sit out for hours without any worries that the salad has spoiled. 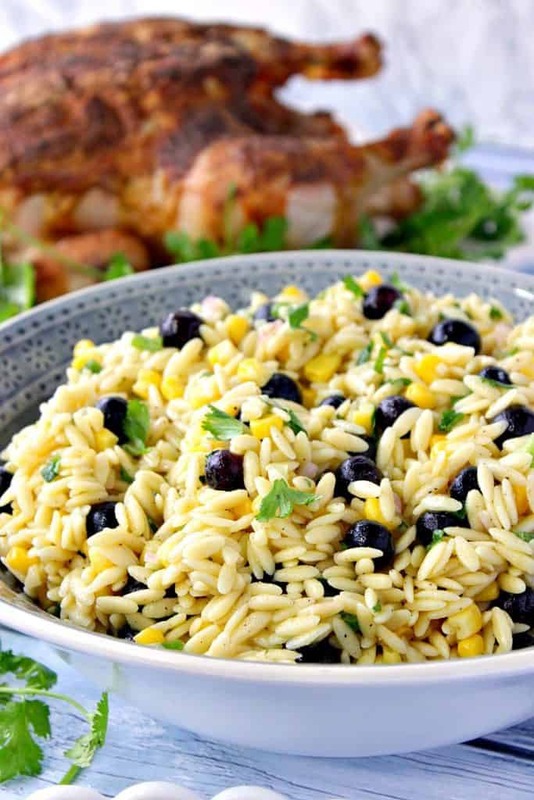 Surprise Chilled Orzo Pasta Salad with Sweet Corn & Blueberries may be a little unexpected, but after your first bite, you'll keep coming back for more! 1 box dried orzo pasta cooked to package directions and drained. 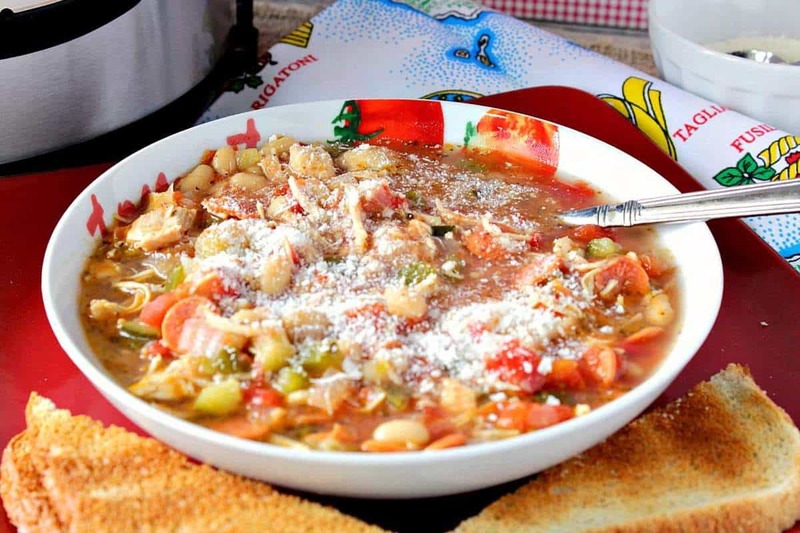 Add the cooked pasta to a large bowl. In a medium bowl, whisk together the lime juice, olive oil, salt, pepper, shallots, mustard, and honey. Pour the dressing over the pasta and stir to combine. Add the corn, blueberries, scallions and ¼ cup of the chopped cilantro. Stir well. 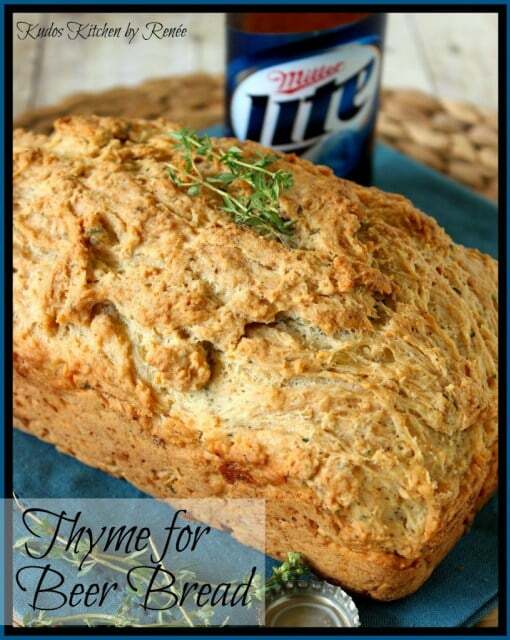 Cooking with fresh herbs is the single most flavorful way to wake up the flavor to all your foods. 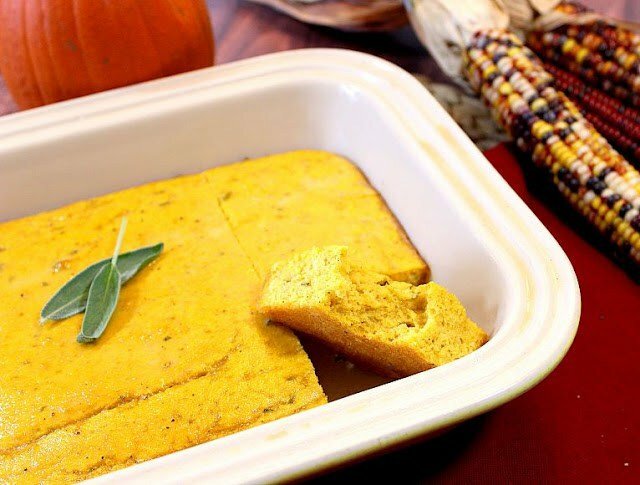 Whether you’re cooking sweet or savory, it’s the addition of fresh herbs that will set your dish apart from all the others! If there is ever anything I can paint for you, from aprons to glassware, please don’t hesitate to contact me or visit my shop. Custom orders are always welcome and I will paint and design from any idea, photo, or description you send my way. My hand painted aprons are heat set for durability and long wear. Each apron is a 65/35 cotton poly blend. They have adjustable neck straps, extra long ties, and two large front pockets. My aprons are not listed in my shop at this time so if you’re interested in ordering one, please drop me an email at: info@kudoskitchenbyrenee.com for ordering information and a price quote. So interesting! What an unexpected combination of flavors! 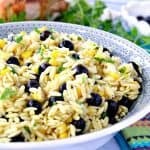 Love the combo of sweet corn with orzo! 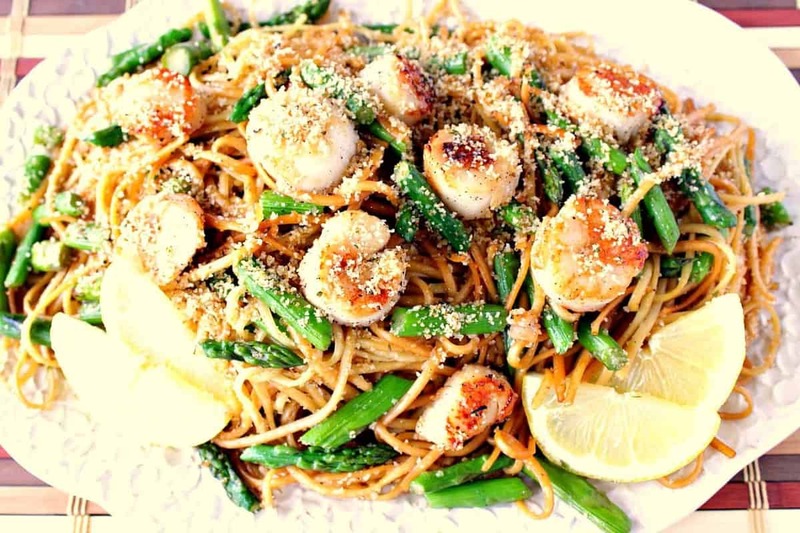 This dish just screams ‘SPRING!!”. So beautiful and flavorful! 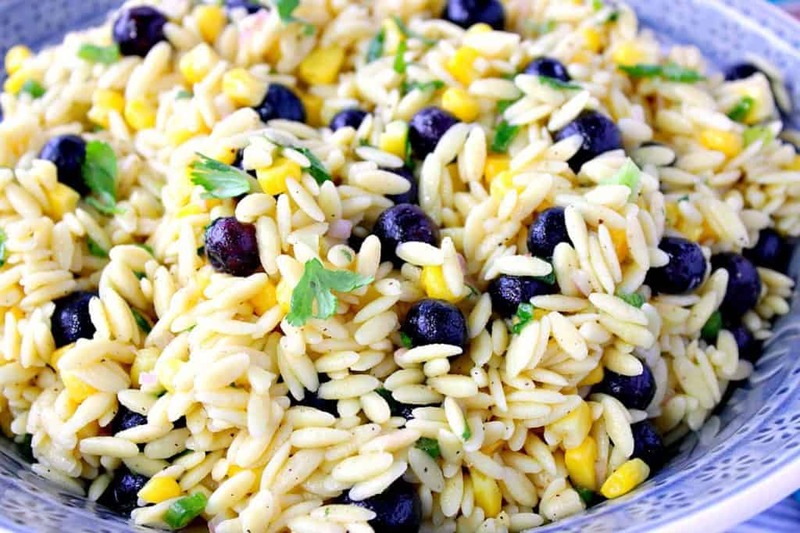 Corn and orzo are awesome together, but I love the blueberry addition! That is such a pretty dish and I love the flavors in it! I have never thought about adding blueberries to pasta salad. I like it!